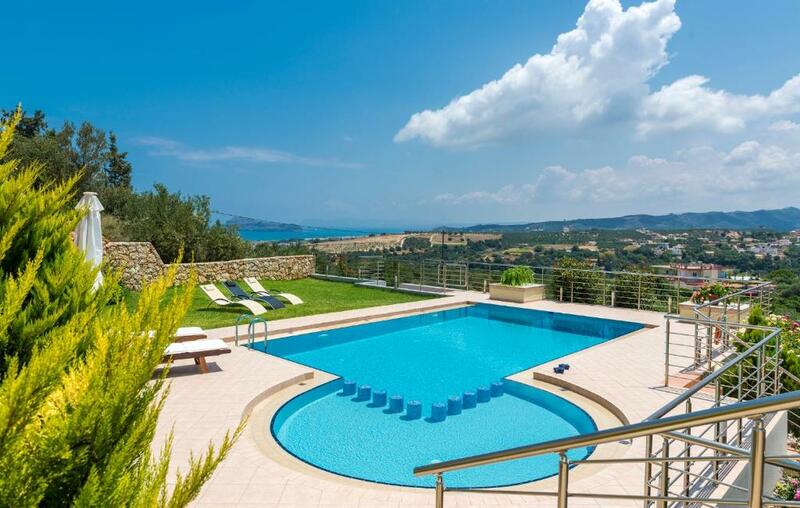 Within a 5-minute drive of the beach of Gerani, Villa Athinais offers luxurious 3-story accommodations with 2 fully fitted kitchens, spa bath and mini gym. It includes a swimming pool with sun beds surrounded by a well-kept garden. 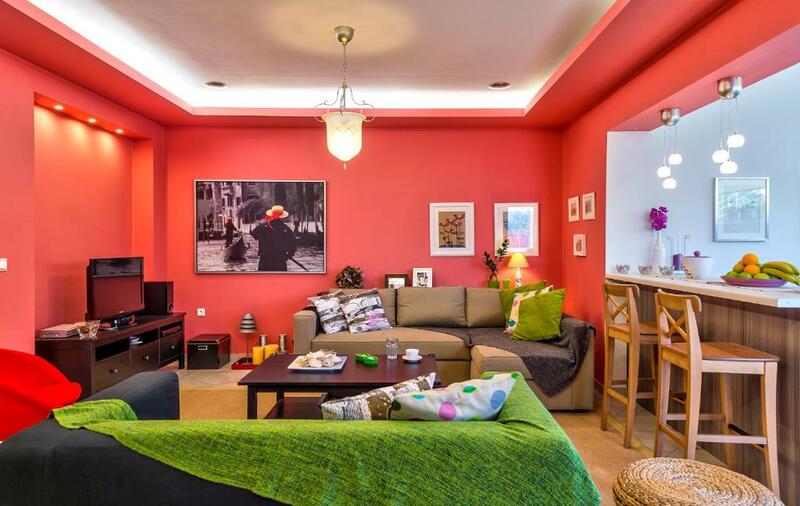 Athinais villa is decorated in colorful accents and features classic furnishings. It consists of 3 bedrooms with attached bathroom, a spacious living room with fireplace and a dining area. Modern facilities include a computer with free Wi-Fi access, 4 satellite LCD TVs and DVD player. 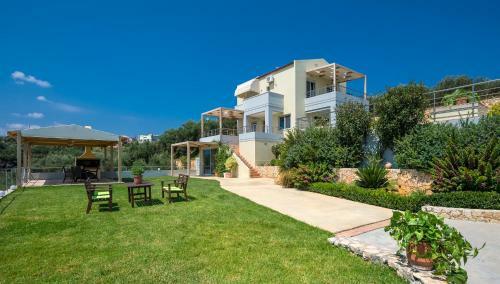 Each floor opens out to a big furnished balcony with views over the lush countryside and the Cretan Sea. 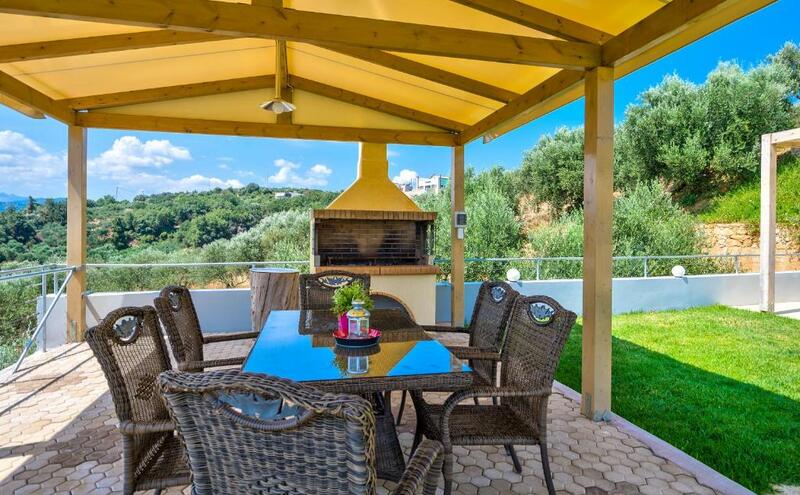 The villa also features an outdoor dining area with BBQ facilities. Upon arrival, guests receive a welcome package with traditional Cretan products, locally produced wine and olive oil, and fresh fruits. Within walking distance, you can find shops, taverns and super markets. The seaside resort of Platanias is 1.2 mi away, while the scenic town of Chania is at 8.7 mi. Free private on-site parking is available. 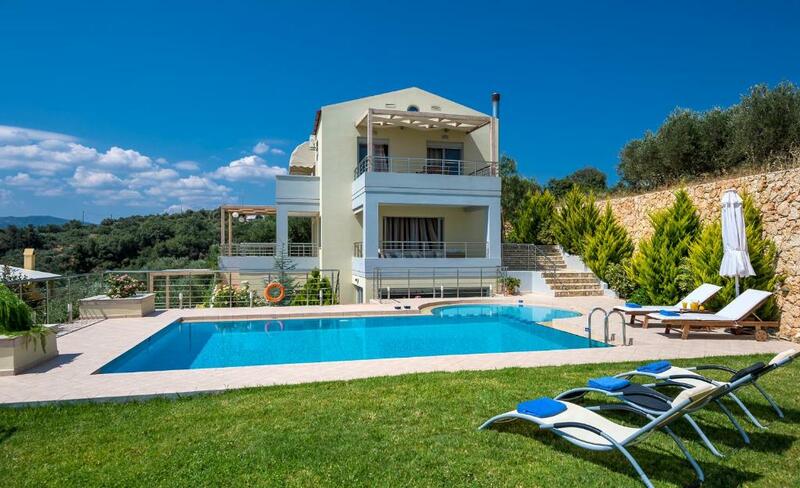 When would you like to stay at Villa Athinais? Unique & romantic location! Villa Athinais is a brand new luxury villa 200sqm which is located in the tranquil village of Gerani, 15km west of the city of Chania. Following a small road up to the top of a hill this stylishly decorated modern holiday villa is located away from the crowds, offering stunning & amazing views of the Cretan Sea and the mountains. 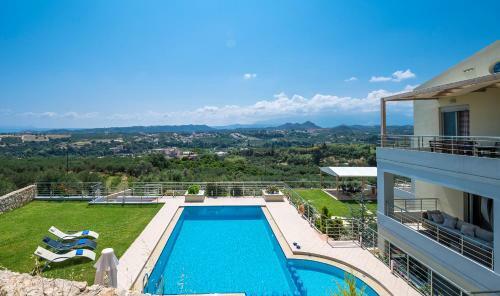 The villa is built in maisonette style in three levels, in a plot of 3.500 sqm private land, surrounded by olive &orange trees, flowers and beautiful gardens. The property offers extreme privacy and peaceful and its ideal for families with children,group of friends , the perfect escape! The accommodation is bright and spacious, very attractively decorated and furnished to a high standard.Villa Athinais offers guests all the necessary amenities for a memorable stay in one of the most tourist locations in the area of Crete. Villa Athinais has 3 comfortable bedrooms on the top floor with en suite bathrooms and a luxury studio with fully equipped kitchen, spacious living room with sofa bed and a luxurious bathroom with Jacuzzi on the lowest level. 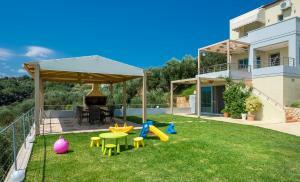 The Villa can comfortably accommodate up to 8 quests (6 adults & 2 children). House Rules Villa Athinais takes special requests – add in the next step! Villa Athinais accepts these cards and reserves the right to temporarily hold an amount prior to arrival. Please note that the outdoor swimming pool operates from April till October. It can be heated at EUR 60 per day. Please inform Villa Athinais of your expected arrival time in advance. You can use the Special Requests box when booking, or contact the property directly using the contact details in your confirmation. We need at least 5 reviews before we can calculate a review score. If you book and review your stay, you can help Villa Athinais meet this goal. The house was just perfect for our holiday, owners were great too <3 someday we will surely come back!